Includes two heavy duty ratchets and two Ancra Classic buckle tie downs. 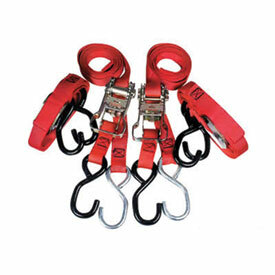 All straps are 1" x 66" top quality nylon web straps with rubber coated hooks. Constructed of abrasion resistant nylon webbing, with premium heavy duty 1" cam buckle with zinc cam and pressure plate, (helps reduce webbing abrasion) and vinyl coated hooks. 1,200 lbs. assembly strength and 400 lbs. working load limit. These last a lifetime if you take care of them, good stuff! These were the first quality, made for dirt bikes, set of straps I've bought. Compared to my old set I'm extremely happy. I was hesitant at first to use just the cam buckle straps but so far they've been rock solid and super easy to use. I still like the ratchet ones as well when I have an extra bike or an ATV along. These are high quality straps, strong, easy to use, have lasted a long time. Previously I had been using the cheapo wal-mart brand tie downs, until a bike came loose and ended up laying on the trailer. So far, I've had these ancra straps for the same amount of time as the cheapo straps and they still look brand new. if you are tired of those cheap tie downs from walmart that always seem to break when you need them the most, then get these. i have been using them a couple years now and they are still 100% perfect. I will never buy another tie down pack other than these long as they are available. i strap down 2 quads in the back of my truck with these and drive hundreds of miles to ride and never have an issue with tie downs coming loose. Ancra has always had the best tie-down straps of anyone. Not like the cheap ones you find at 4 for $10. These are not the cheapest, but they are the best you can buy. Will last you a lifetime. They work great easy to use and strong. Overall good buy, perfect for the ATV rider. I have bought several different kinds of tie down straps. The Ancra straps are the best I have found. They also have lasted the longest for me. They may cost more but are worth it. These are great tiedowns for securing your ATV. There are less expensive tiedowns, but these are worth the money. Very heavy duty.